You may already use your Drobo as a backup device. A second Drobo works very well if your primary data is also on a Drobo. Cloud backup is not always practical for protecting large amounts (terabytes) of data due to the cost of cloud storage and the rate at which you can upload and download data. However, it is possible to use another Drobo you own at an offsite location to store large amounts of data without the recurring costs or storage limits. Then you can use cloud storage to protect really valuable data with an additional copy. 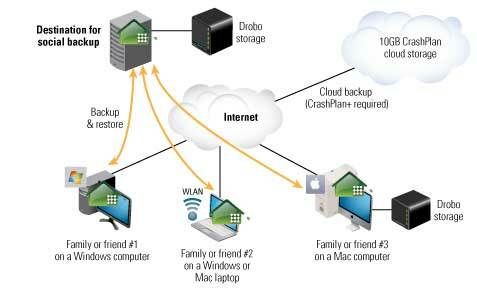 With Drobo and CrashPlan, it is very easy to configure and perform offsite backup. You can back up data to a second direct-attached Drobo at an offsite location. CrashPlan also enables something called “social backup,” where Drobo storage at the site of a friend or family member can be the destination for offsite backups. CrashPlan has several offerings including business and cloud services. This document focuses specifically on the free version of CrashPlan (which doesn't include cloud backup), but can also be used as a general guide for CrashPlan + and CrashPlan Pro.